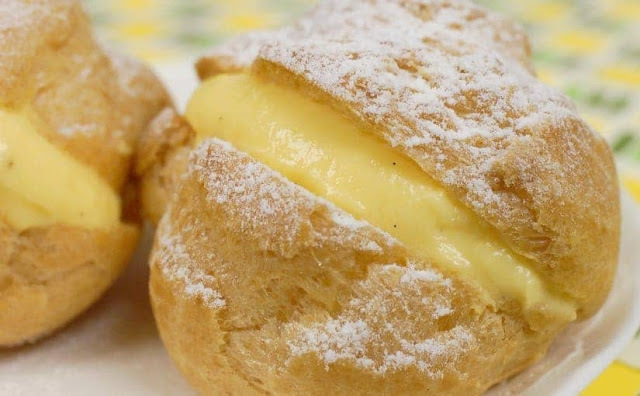 Today recipe is Cream Puffs with Vanilla Custard- Happy Vanilla custard day ! In a saucepan over medium heat, combine milk, heavy cream, and vanilla extract. Stir continuously for 5 minutes. Remove from heat when mixture is hot but not boiling. In a large heat resistant bowl, whisk together egg yolks, cornstarch, and sugar until well blended. Slowly pour hot cream mixture over egg yolk mixture, whisking constantly to prevent eggs from scrambling. Return custard mixture back to original sauce pan now set on low heat. Stir for 8-10 minutes or until custard has thickened. Do not bring to a boil as the custard will curdle. Serve warm and refrigerate any leftovers.